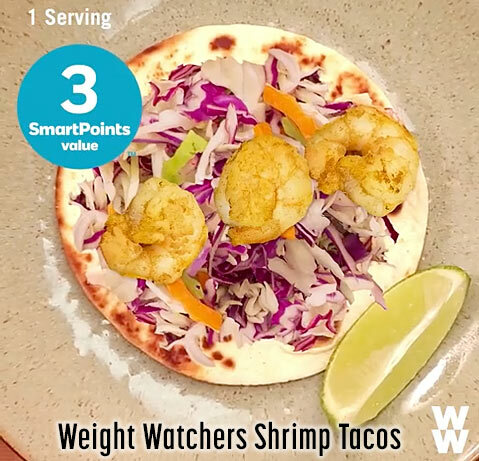 Weight Watchers: Shrimp Tacos Recipe | Easy + Only 3 SmartPoints! Instructions: Mix all ingredients in a bowl and reserve. Cook shrimp until done. Set shrimp aside. *If you are really into spicy, a couple diced chili peppers are also a great addition. We also like to cut corn right from the ear and fry it up (in light olive oil) to serve on the side. *That makes a lot of slaw! If you only like a little, (and prefer to add some chopped avocado) maybe halve that part of the recipe. If you add avocado, it will add one Smart Point, though. Serves 4-5. Only 3 Smart Points per serving! This entry was posted in recipes, weight watchers and tagged mexican, shrimp, tacos, weight watchers, ww recipe on May 4, 2018 by kevin.